This German company is still a new kid on the block in the wooden toy industry, having only sold the beautiful Quadrilla marble runs on the international market since 2005. In this short period, however, the company has managed to develop a strong legion of fans who love the terrific ranges of bright, sturdy and design-conscious Quadrilla toys. Similar to Plan Toys, Quadrilla spans many genres including construction, educational and role-play. 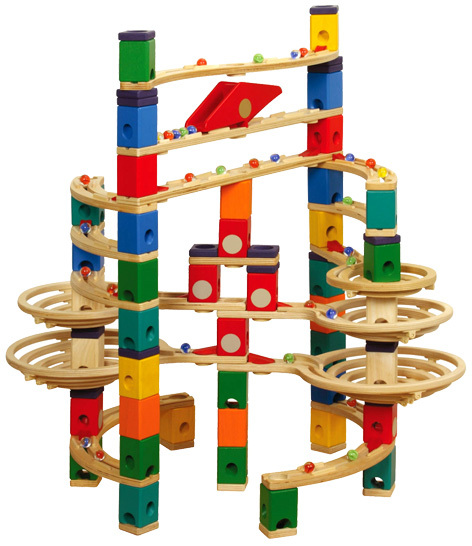 Their wooden marble runs are completely modular, ensuring that they can be added to over time. This is just as well because Quadrilla marble runs are very much at the high end of the market in terms of price! Particularly popular is the Quadrilla Twist and Rail Set which can be added to with the Extension Set that comes with a variety of blocks, risers and rails which allow 22 additional layouts. Thanks to Quadrilla marble runs, gravity has never been so fun!